Centrally located in the resort city of Palm Desert, this resort features six lighted hard-court tennis courts, an outdoor pool, and a fully equipped fitness center. Relax in the spacious 2-room suites with a private bedroom, sofa bed and kitchen. 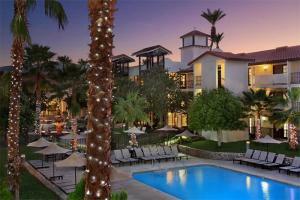 The resort is near golf courses, the Living Desert Zoo, and the Palm Springs Aerial Tramway. Located about 13 miles from Palm Springs International Airport.